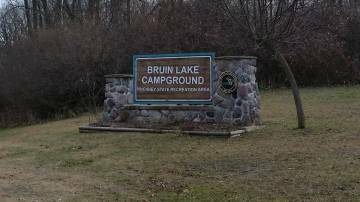 Description: Bruin Lake campground is in the Pinckney SRA and has two loops. The upper one is an older loop with mature trees and lots of shade. The sites are gravel/grass. The newly renovated lower loop is more open and has paved sites. All sites have 20/30A electrical. Water spigots are located centrally in the loops. There is a two lane dump station also. There are also yerts available as well as one cabin. The bath/restrooms are located in both loops also. There is a single lane boat launch which allows access to Bruin Lake, which then connects to seven other inland lakes with very good fishing. There is a small grassy swimming area, but no sand beach. The campground does fill on holiday weekends so reservations are recommended. My family likes this little lake. Extraordinary for an outing and unwinding in an internal tube. The pleasant thing is that those with minimal ones can sit under a tree, as there's really trees near the shoreline. My dislike is that the new water play structure they made this calm little lake a little stuffed some days. I can tell more, just write my essay private message. My family also like this Bruin Lake State Park and I had visited this park and this is awesome place there is silence and this silence make more beautiful.